Here at CELLINK, we want to inspire you to print more advanced models using the BIO X. In the following section, we demonstrate how to print a multi-layer grid using different bioinks for the infill and perimeter. In this video, we demonstrate printing the perimeter and the infill of a multi-layer grid construct with two different bioinks. GelXA LAMININK 411 and CELLINK LAMININK 521 were diluted with 10% cell suspension and placed in the first and second pneumatic printhead, respectively. GelXA LAMININK 411 was used to print the perimeter through a 25G nozzle at 5 mm/sec and 30-35 kPa with a 650 ms preflow delay. CELLINK LAMININK 521 was used to print the infill through a 25G nozzle at 10 mm/sec and 15-20 kPa with a 300 ms preflow delay. The grids were printed on a 12-well plate lid for better visualization. Constructs printed with GelXA LAMININK 411 and CELLINK LAMININK 521 can be crosslinked by adding our crosslinking agent. After one medium wash, your cell laden constructs are ready to be cultured in standard cultivation environment. The STL file for printing the grids in this video can be found here on Bioverse. To make this particular 10x10x0.75 mm grid choose 10% infill density and use a rectilinear grid pattern. CELLINK LAMININK bioinks share the advantages of our universal CELLINK Bioink and in addition have the functional laminins that can be tailored based on the cell type. 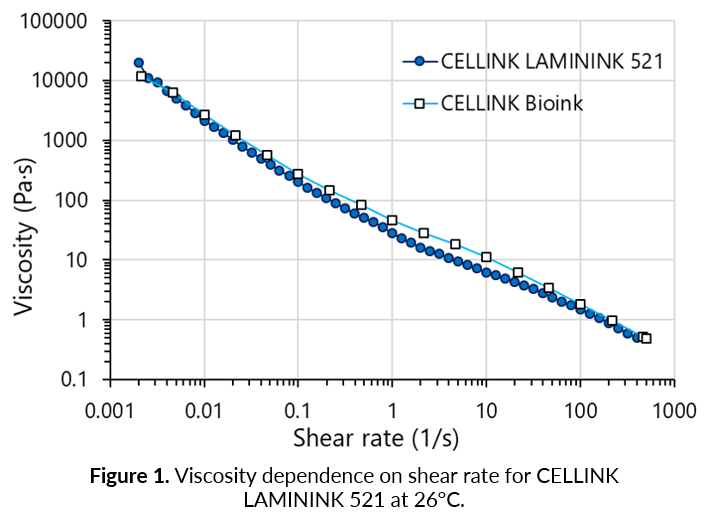 The printability of the CELLINK LAMININKs is not affected by incorporation of the laminin component into the CELLINK Bioink base. 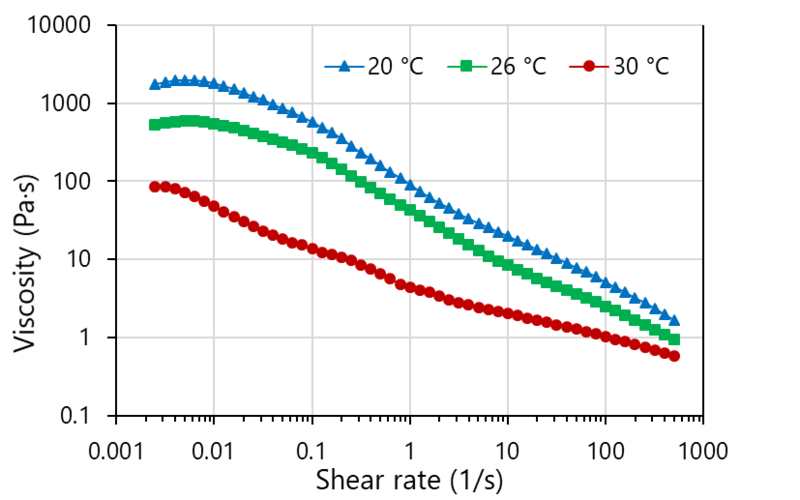 Flawless shear thinning behaviour at a wide shear rate range (Figure 1) and temperature-independent performance allow smooth mixing and printing both at room and physiological temperature. The addition of xanthan gum into our GelX series improves the consistency and printing performance of the gelatin-based bioinks. GelXA bioinks, including GelXA LAMININK 411, exhibit smooth printability at a wide temperature range and a good shear thinning behaviour, independent of ambient conditions. The consistency of GelXA LAMININK 411 remains relatively stable in the temperature range between 20°C and 26°C while decreases in viscosity at 30°C and above (Figure 2). Large tissue models can demonstrate complexity of a tissue by spatially organizing cell populations with encapsulation by extracellular bioink environment. 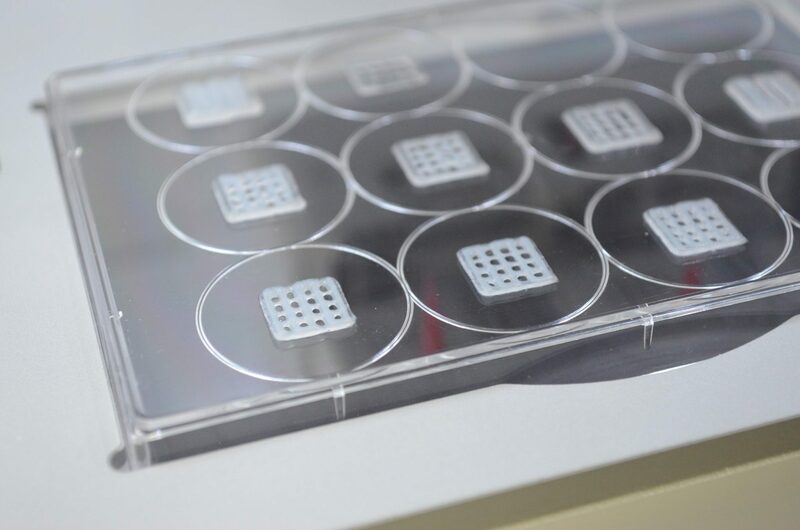 Each cell type has niche environments made of extracellular matrix proteins such as laminin, collagen, elastin, and others, hence, niche specific bioinks such as CELLINK LAMININKs can be used to tailor to the specific cell types. An example for model can be to study angiogenesis in which the perimeter is GelXA LAMININK 411 encapsulating endothelial cells and the infill is kidney organoids in CELLINK LAMININK 521. The tissue constructs can be observed over time for endothelial micro-vessel sprouting and kidney organoid development.